The bustling, vibrant atmosphere and elegant surroundings make this the perfect place to enjoy a relaxed dinner with family and friends. Each day the restaurant’s chefs prepare an exciting selection of cuisine for a sumptuous evening buffet, featuring contemporary international flavours and a selection of delicious desserts, and on Sundays there is live jazz to accompany the fabulous carvery lunch. 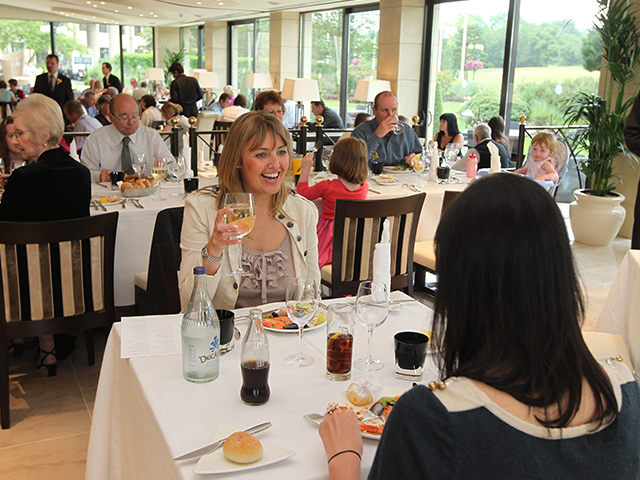 In summer, guests also have the option of dining alfresco, relaxing on the lovely open-air terrace (great for people-watching) with views towards the Roman Road golf course. The Olive Tree is an ideal location for relaxed family dining with a children’s menu available all day, every day and activity sheets on hand to keep little ones entertained. The Olive Tree also offers an early evening children’s buffet at 6pm every Saturday evening and daily during school holidays. We had a lovely dinner at the olive tree on Sunday night. The waitress was very friendly and professional. Looking forward to dining with you again very soon. Waited 30 minutes for drinks. The food had flies on the salad. We had reservations for 6pm - however service wasn’t ready until 6.15pm. Once shown to our table, the food on offer was varied and tasty. The desserts were slightly poorer than the other courses. The drinks choice was good however the draught beer was flat/stale and on hindsight I should have returned it. Buffet style ideal for families wanting to dine at their own pace. Food was tasteless wasted most of what we had. Tried lots of options in order to have some food after a long day. Service was poor with plates either being left on side or partners plate taken whilst I was still eating. We were very dissapointed with the food. We have dined with you before and the quality and choice was excellent. This time the food was only lukewarm and there wasn't the selection that we were expecting. A wide selection of food and everything we tried was very good! Amazing service from Custodio, Fernandez, Simon and Beth. They were all so kind and attentive. Good wine list and good food. Slow clearing the table between courses. The sticky toffee pudding was very disappointing more of a plain sponge :( there was supposed to be a children’s buffet between 6-7.30 but didn’t see one. There was food available that our children were happy to eat though. Decent food, decent service, decent price. The food was incredible, hands down the most tender and beautifully cooked beef brisket and lamb. All good was replenished quickly and warm and tasty. We came for the inclusive dinner buffet and the food was inedible. It was dry and tasteless, seems like it had sat there forever. Very disappointing  and quite unacceptable for a 5 star hotel. fortunately breakfast was much better. Great food and drink and plenty of options. We would happily return however I didn’t feel my partner and I received the same level of service as other guests as a result of our age. We had to stand up and ask if we could order drinks because we had been waiting more than 10 minutes (other customers didn’t seem to have to wait more than 5 minutes) and then we had to get up again to ask for the bill despite waiting 20 minutes and the restaurant closing soon. Also, some of the young waitresses seemed utterly hopeless, careless and unable to interact with us as well as other guests. Would return but seer clear from the Chinese unless improvements are made. Please ask the chef to every now and then have a look and actually taste the food he is serving. I had sweet and sour chicken, my husband had the roast and he had to choose something else as it was not warm let alone hot. The chicken was that dried up there was not a piece of chicken inside the coating only very hard dry cardboard. They need to turn the heat up as most of the food they are serving is look warm and i don't think it is reaching the standard of what you should be in your lovely establishment. Limited choice of meals for vegetarians.